The above data are from the CDC and show the percentage of Americans surviving at each age for three different points in history - 1900, 1950, and 2006. 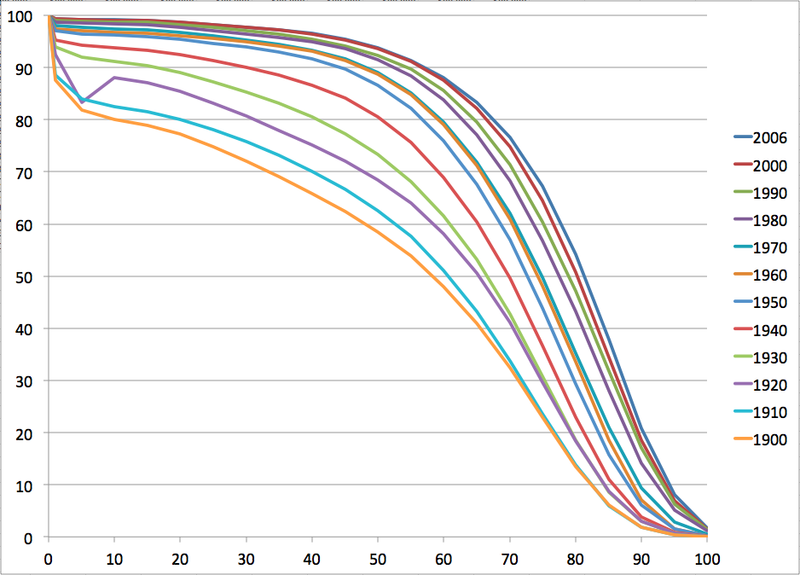 I would expect the pattern to be fairly similar for other developed countries. 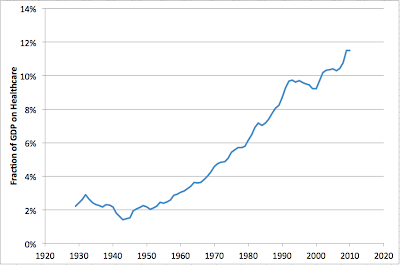 The point, apropos of yesterday, is that there was a lot more progress from 1900 to 1950 than there was from 1950 to 2006. And note that GDP has itself been growing a few percent a year on average. Maybe there'll be some massive breakthrough in the future that will change this situation, but there's sure no evidence of it in the data at present. Rather than being immortal via being uploaded into a computer in a few decades, it seems a lot more likely that we'll all continue to die of chronic diseases somewhere between age 70 and 100. (Ray Kurzweil not withstanding). 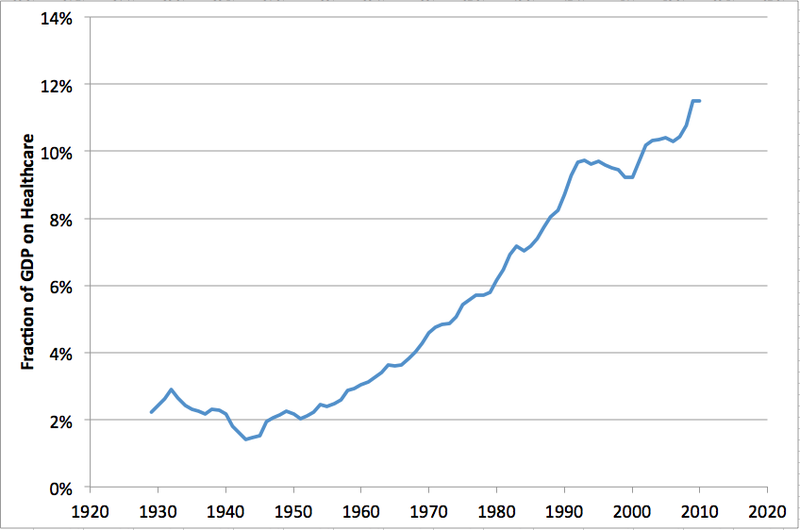 whats the blip in the 1920s? Is that the 1918 flu pandemic? It's almost necessary to see those curves for other countries, given how much less they spend, and how much longer they live. We're a notably awful data point; without looking at other countries, one might get the idea (as David "Magoo" Brooks did in his column today) that we cannot do better. I want to know how the other guys do it. It could be many things -- universal care, smaller gini coefficient, more exercise, better diet -- and maybe it is all those things. But I'm tired of objectively wasting money on health care. I want what they've got, and I don't see why we don't all deserve it. Stuart: It is useful to distinguish the role of public health from that of medicine in the amelioration of mortality rates. The upward shifts of our lx curves that you have nicely demonstrated were due much more to public health (which is relatively cheap) than to medicine (which is expensive). Some great stats. Clearly, we haven't cracked the ~100 year limit to lifespan problem yet - there are more old people today, but not significantly older old people. But there's much more to human augmentation than simply extending lifespan. Communicating in something close to real time with anybody in the world, and being able to access and analyze significantly more information, seems a major increase in an important aspect of humanity - the extension and deepening of our awareness through the use of pictures, sounds, numbers and words. Most western European countries spend 9-11 % of their GDP on health care compared to the US 16 % and have about the same life expectancy. Siple comparisons are seductive, but misleading. The US has much greater levels of diseasese of affluence: obesity, diabetes, etc. Further, the US funds drug development for the rest of the world. Bottom line: as agriculture and manufacturing shrink due to continuing growth in labor productivity, goods give way to services. Which service sectors of the economy would you consider as value added? Which would you target for expansion: entertainment, law, finance, or medicine??? 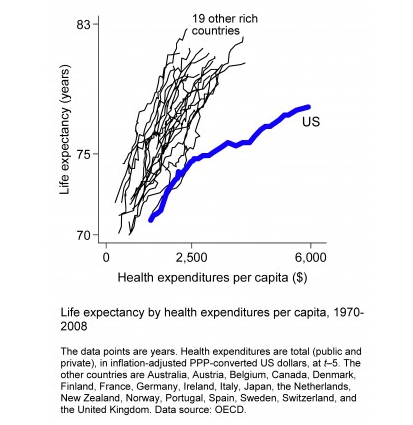 @NickG - "diseases of affluence" sounds great, but things don't seem to line up to support it. I've had a heck of a time finding median incomes for comparison, but (1) we have a high gini coefficient, (2) some European countries are nearly as wealthy (per capita) as us, and (3) in this country, at least, wealth seems to correlate with increased life expectancy. Or to put it differently, if it's diseases of affluence that are disproportionately afflicting us, how come all our poor people aren't increasing our life expectancy more? Other nations also fund drug and otherwise medical development. Regarding drug development, two of the six largest pharmaceutical companies are based in US and remaining four in Europe. Besides I guess that pharmaceutical companies add to the GDP rather than being a burden. Concerning the US versus other OECD countries issue, Paul Kedrosky posted an interesting chart which I have reproduced in an update to the post above. The US really is very noticeably worse than the rest of the world in terms of the diminishing returns. Stuart, re the chart showing health care rising as a proportion of GDP: isn't this in some sense inevitable? What I have in mind is the principle of diminishing marginal returns, and specifically the idea that the returns to different goods diminish at different rates. Therefore as income and wealth rise, the mix of goods that people buy changes. It seems likely that as a person's wealth increases, at some point the person will begin to value extension of life (first) and extension of health (second) over acquisition of other things. Therefore, the person will spend an increasing proportion of her income on healthcare as her wealth rises. It's likely that there are cultural differences in the strength of this effect. For example, the French seem to value leisure and the preservation of cultural identity more than do Americans, and the Germans value social cohesion and environmental cleanliness more, so as French and German people get more wealthy, the proportion of their income spent on healthcare rises more slowly than Americans'. The track of the USA in Paul Kedrosky's chart in your addendum might be explained by cultural factors and by observing the increasing bimodality of wealth and access to healthcare in the USA - in health terms the US is a poor nation and a smaller very rich one occupying the same geographical area. The US has significantly more obesity than the rest of the world (the health effects of this are commonly known as "diseases of affluence - this isn't a moral judgement, it's a reflection of the fact that affluence brings more and cheaper food, and less physical labor), and that obesity has been rising during the last 30 years. Obesity has a very large effect on lifespan and morbidity - this has to be taken into account in any analysis. From that last graph the take home message is that we should outsource healthcare. 1) in the developed world, the people who are obese are the less well-to-do. 2) What Americans have that other people don't is an unbelievable level of stress. Among the countries I've lived in (West Germany, the former East Germany, Italy, New Zealand), Americans face a unique level of financial insecurity, a unique threat of violent crime, a society built for cars not people in which every day-to-day task you can name is difficult and time-consuming and complicated, an insane political system that periodically throws everyone's lives into turmoil, uniquely constant bombardment with muzac, a uniquely long working year, a unique level of fear paranoia and rage in the media . . . this place is nuts, and it's killing people. Just look at the level of medication in this country--for pain, for depression, for sleeplessness, for sleepiness, for twitchy leg syndrome, for "ADHD," . . . it's mad. We're not suffering from diseases of affluence; we're suffering from diseases of stress. 3) American health-care is garbage. I'm middle class, and I can't even get decent health-care here. Health care is a war-zone for me, and I'm probably in the top third of incomes. I know people who are rich, and they get great health-care, and they pay less than I do for it. They have very powerful institutions that negotiate for them. Why is all this happening? One reason: have a look at the level of unionization. 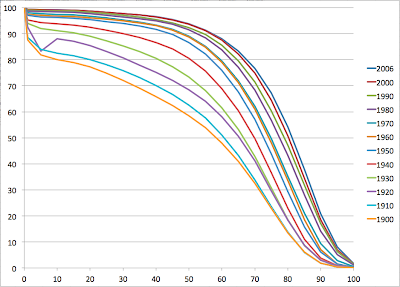 what you're seeing here is called "squaring the curve". It's what happens when survival rates for individual illnesses improve, but the underlying problem of the aging process isn't addressed. Most major causes of death grow exponentially with age. Demographers will tell you that reducing the death rate from any given illness by 50% will give a pretty marginal improvement in overall longevity because the death rate from other things will grow very quickly and replace most of the improvement. The answer: research aimed at aging itself. This would be much, much more cost effective than trying to hold back the tide of individual illnesses. Unfortunately, drug companies don't want to tackle that - they publicly say so. Now, is aging curable? Of course. The human body is not supernatural - it's an engineering marvel that can be reverse engineered and understood. Why do small mammals like mice live 4 years and very similar small mammals like bats live 40 years? Why do some birds live 6 years, and other 60 years? There are obviously very small genetic differences that can be understood and used to development drugs or genetic treatments. To believe otherwise is, IMHO, a religious statement. A large part of the problem is the failure to distinguish between "extending life" and "extending death" - having spent much of my adult life caring for elderly family members, working in nursing homes and also working hospice, I would note that in many cases, not only are their diminishing returns in demographic sense, but also in every other measure of success, including happiness, quality of life, pain levels, etc... Despite your last poster's claims, the reality is that none of us get out of here alive, and the removal of many medical procedures from the end of life would only make life better for most people. I remember arguing with my husband's grandfather's doctor - he was in a final decline, and suffered terribly from constipation caused by a heart medication he was on. I suggested, since he was very ill at that point, that we simply take him off the medication. The doctor reacted in horror "But he might have a heart attack!" I just laughed - for a 96 year old man in failing health, a heart attack that carries him off is the very best possible outcome. And yet, the whole culture of end of life medical care prevented the doctor from seeing that.